Central England Co-op bosses have teamed up with council enforcement officers to install a range of new security measures at a Castle Donington store in a bid to end the scourge of fly-tipping at the site. The team at the Central England Co-op Food Store, in Station Road, decided to link up with waste enforcement officers from North West Leicestershire District Council (NWLDC) to encourage people to correctly use the recycling facilities onsite and to not just illegally dump items in the car park. Additional measures are now being put in place to educate members of the public about recycling, deter any potential fly-tippers and catch anyone who still tries to flout the restrictions put in place. These measures include trail cameras to monitor the site and new signage reminding people that fly-tipping is an offence and that the recycling centre is closed between 10pm and 8am. In 2017 NWLDC installed temporary cameras at the site and recorded five cases of littering and 13 cases of fly-tipping that were dealt with by means of a Fixed Penalty Notices which were all paid. The problem has since re-emerged meaning the council have now installed the trail cameras to both deter fly-tippers and catch them in the act. Store Manager Oliver Buxton said: “Being a Food Store that sits at the heart of the community, hosting a recycling facility is one of the many services we provide to support our customers and members. “However, recently we have had a spike in people fly-tipping when the recycling facilities have been full or closed which has led to people dumping rubbish overnight, making noise at unsociable hours and leaving the area untidy. “Everyone who works at the store works hard to try and contain this problem but we have now linked up with officers from North West Leicestershire District Council in an effort to try and put an end to it to ensure a better experience for our customers, members and people across Castle Donington. “We’re delighted that the council is installing cameras to monitor the site and putting in place new signage explaining that fly-tipping is an offence and what hours the recycling facilities are in use. Clare Proudfoot, Environmental Protection Team Manager at North West Leicestershire District Council, said: “When we were made aware of the issues staff at the Castle Donington store were dealing with, we made it a priority to act. “We employ a number of preventative measures to discourage fly-tipping and trail cameras are one of the most effective. They deter fly-tippers and provide valuable evidence by catching people committing the crime. 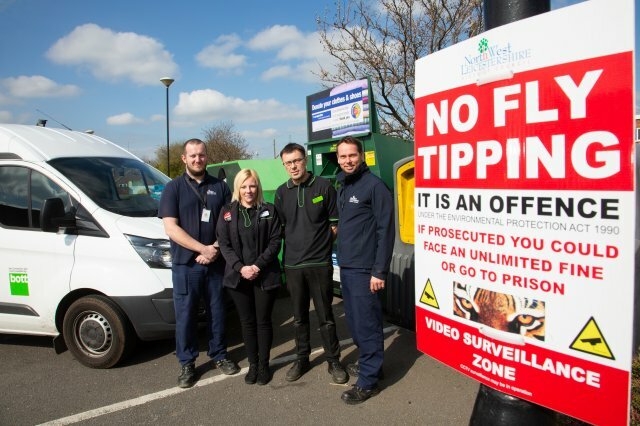 Picture caption: Colleagues from Central England Co-op (Kate Bradley and Stephen Bryan) and officers from North West Leicestershire District Council (Marc Orton and Ian Webster) join forces in an effort to put an end to fly-tipping at the Castle Donington Food Store, in Station Road.